A powerful, easily managed, aggregated search machine. Discover the best visual content available to license for your next campaign. With one click, iSPY searches through the millions of images from leading stock giants, speciality collections and best-in class individuals to provide you with the broadest selection of content. All available to license safely because that’s how we roll. Quickly search through leading stock giants, specialty collections, and best in class photographers and film makers to find that perfect image, fast. Making the business of licensing a piece of cake. 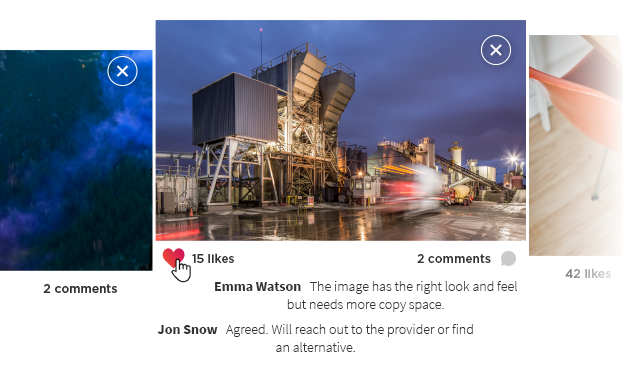 Whether you’re looking for stills or video, rights managed (RM), royalty free (RF) or creative commons (CC), iSPY’s intuitive filtering options will refine your search and find the right content, faster than you can order. Collaborative light boxes provide teams with all the tools they need to share, annotate and discuss creative content. Whether you’re planning your next multimedia campaign, or simply looking for that leading shot, our creative dashboard gives you the power to organize, document, and propel your creative vision forward. License with peace of mind. Chasing expired licensing agreements and finding paperwork isn’t how you should be spending your days. Think of iSPY as your trusted super organized assistant. iSPY provides you with a safe place to store your license agreements, keeping track of where you’re using the content and when the license is going to expire. We’ll even send you a reminder when something needs your attention.